Soft & Double Chocolatey Gluten Free Cookies that are perfect for a treat – best of all, you won’t even realise they are Gluten Free! 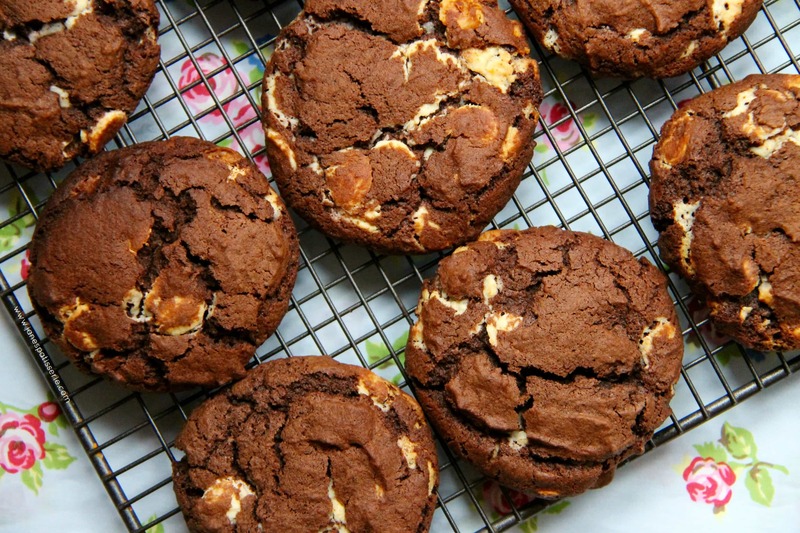 This is genuinely one of my favourite cookie recipes, even though its gluten free. They are the perfect texture for me to be chocolatey & gooey, but the perfect cakeyness! I have experimented with other Gluten Free Cookie Recipes in the past, and I will probably be posting another one soon using Almonds for example, but with this one I wanted to demonstrate that Gluten Free Flour is definitely a good thing! Obviously however, textures and such are different when there is no Gluten in a recipe – some it doesn’t matter at all, but sometimes it can make a different with things such as Cookies. I don’t mind the difference, such as how these are slightly more cakey – but thats perfectly delicious to me! 🙂 If you are Gluten Free I’m sure you already know this, but just double check that your Baking Powder and such are also Gluten Free as some apparently are not! I love these, so I know you will too! And if you are GF, I hope you approve!! 🙂 I mean come on, just how chocolatey and yum do they look! Heaven! This recipe makes 15 Cookies! 1) Preheat your oven to 180C/170CFan and line 2-3 Baking Trays with Parchment paper! 2) Cream together your Butter and Sugar until light and fluffy (I use an electric stand mixer with the paddle attachment to make this all easier) Once the Butter/Sugar Mix is combined, start gradually adding the egg to the mix whilst still beating, continue till all is incorporated. 3) Sift in the Flour, Cocoa Powder, Bicarbonate, and Baking Powder in to mixture and beat again – should make a nice dark but smooth cookie dough! 4) Mix in the Chocolate Chips and then spoon onto the Baking Trays either using a tablespoon, or a cookie scoop! (I do 6 per tray so they don’t spread and touch) and Bake in the oven for 12-15 minutes until cooked through! They should rise slightly when baking! 5) Leave to cool on a wire rack and then devour them all yourself. No sharing allowed! You can obviously use the same recipe to make normal cookies, but I like these as the Gluten Free ones! 🙂 Gluten Free Plain Flour can be found in most stores, sometimes not in the baking isle but in the ‘Free From’ section! These will last in an airtight container for 4-5 days if they last that long! Find my other Gluten Free & Cookie Recipes on my Recipes Page! Older Next post: Pistachio, Hazelnut & Chocolate Biscotti! Newer Previous post: Lemon & Blueberry Muffins! Can you use coconut or almond flour for these . I’ve never tested it as I was asked to do one with GF flour, I’m developing one using different flours though! Between Jane, I also mailed you few days back, did you checked that, can you help? The Gluten Free flour is just sold as “Gluten Free Plain Flour” in my shop so I’m not sure what its made up of entirely I’m afraid! 🙂 and I haven’t been able to check my emails yet sorry. I’ll have to make these for my dad! He’d be delighted at a cookie good enough to eat. I’m surprised to learn they keep so well but I’m willing to try! My grandmother is gluten free and I am sure she will appreciate this recipe. We have been trying to find a good gluten free chocolate cookie recipe for a while now.